Yes, the third brake light will flash when the four way flashers are being used. I don't see how this is a problem. It flashes with the four ways, so what? How often does anybody use their four way flashers? If I was stuck on the side of a highway, I'd WANT more lights flashing. If it really bothers you, simply drop a diode in the wire feeding to the turn signal switch, "problem" solved, the third brake light won't flash with the four way flashers. I've finally settled on a light. The Alpena HexFire 77118. It's six high output LEDs in a nice housing about six inches wide. It draws 18 watts. Two sheets of red lighting gel makes it perfect. I have Neo magnets for the base to make it removable. 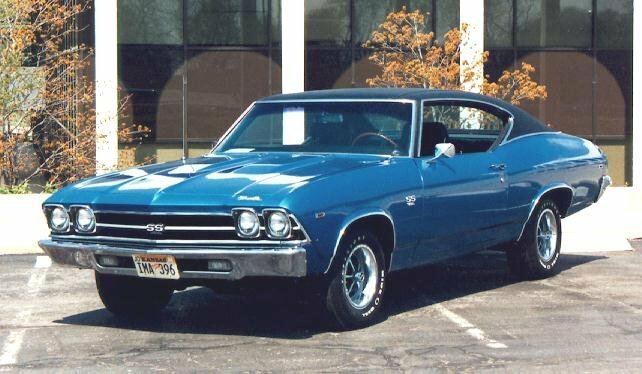 Way back in 2003 I added a high-mount third brake light to the rear window of my 1970 Chevelle by tapping the white wire at the brake pedal light switch, and extending this wire to the third brake light. The LED strip light simply runs to a ground nearby. The light illuminates with brakes and hazards but not with turn signals. I feel safer that big rigs and high-riding trucks and SUVs will see my brake lights and avoid crumpling my rear end. Joe, please tell me which switch to use to prevent the third brake light from flashing with the emergency flashers. Hey Paul, is this light going inside on the package tray? What is the red lighting gel too? THis looks good but a tad pricey. Velcro inside might be an alternative to outside. Do you remember what light you used? THis one looks good. What kind of mounting did you do up at the top of the window? It'll be mounted outside the rear window and removable. I'm adding a wider plate to the mounting bracket and putting Neo magnet strips on it and covering it with a soft material like a thin rubber. When I want to use it, I'll stick it to the painted strip between the trunk lid opening and the vinyl top molding. A thin wire will go into the trunk to a plug. I found the light for $20 with shipping but it generally runs from $33 to $40 ($40 at AutoZone). It's the fourth LED light I bought and the only one that has enough brightness to my liking when covered with the red filter. This simple circuit will eliminate the four way flasher "feedback" to the third brake light. This allows the third brake light to work when you step on the brake pedal and NOT flash when you use the four way flashers. 1970~1972 wiring colors shown, earlier cars may use the same colors, confirm first. Diodes of all sizes are easily found on Ebay. I suggest 30 amp total current diode capability. A single 30 amp diode, if you can find one, will suffice. boyd66k20, the brake light I used was a Pilot LED grill lights CZ-153R ($30) as a pair of red LED strips mounted end-to-end. Similar current product is the Pilot CZ-3149W. The mounting brackets are thin sheet metal bent into a squared Z shape. The top of the bracket has one screw through it upward into the metal barbed strip forward of the rear window that attaches the headliner. One bracket under each end of the light strip held with double-stick foam tape. The two wires go up above the headliner down to the sail panel and into the trunk for power and ground. boyd66k20 and paul bell like this. What did you connect the wires to? What flasher are you using? Reading back in Malibu70's post above, he says he connected to the WHITE wire, which I thought was wrong. It seems that I got my colors mixed up. Maybe I got a head rush laying under my dashboard? My bad... And my apologies! The arrow is pointing the wrong way on the orange wire. DOH! Too late to fix it, edit period is expired. I suppose it points opposite of the way them electrons wanna flow but I think everybody gets the idea-we're a pretty clever group. Rickles, the white wire at the brake light switch was tapped and extended with 18g wire under the dash, behind the sill plate, all the way back into the trunk to an insulated terminal. The LED brake light at the rear window has two wires above the headliner, behind the sail panel, down into the trunk. The power wire connects at the terminal. The ground wire attaches to a sheet metal ground behind the seat. The flasher unit for the turn signals is a common EL12 electronic flasher ($12). The standard thermal flasher would not make turn signals work when 1157 brake lights were replaced with LED bulbs. The flasher on the fuse panel is the hazard flasher, which on my ride is an electronic 536/552-12 ($6). The brake light bracket I made from aluminum, and designed it to be simple and removable with little damage to the car interior. The red LEDs are directed at the rear window without a diffusing lens. I read through Joe's earlier response about Federal Motor Vehicle Safety Standards and how they specify high-mount/third brake lights. The closest match I could find is Standard No. 108; Lamps, reflective devices, and associated equipment. The standard applies to vehicles made after year 2000. Can anyone find a rule that states the high-mount brake light cannot flash with activation of the hazard switch? For comparison, the hazard switch on all my modern vehicles flashes their turn signals, not their brake lights.